Plantar fasciitis is a painful inflammation of the bottom of the foot between the ball of the foot and the heel. Usually it is painful first thing after getting out of bed in the morning or after sitting for a prolonged period of time. This is called "Post-static dyskinesia" - which means pain after being static or immobile for an extended period of time. 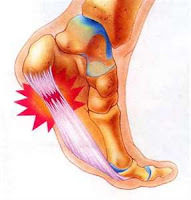 There are several common causes for plantar fasciitis. These include wearing high heeled shoes or boots frequently, gaining weight, or increased activity level such as walking, standing for long periods of time, or stair-climbing. High heeled shoes and boot use can cause this issue by the mere fact that they allow the achilles tendon and fascia to contract and shorten over time. When you return to normal shoes or barefoot, these structures are tight and put an increased amount of stress on the heel bone (calcaneus). The pain comes from this pulling on the bone and microtrauma where these structures attach to the bone, and the resultant inflammation and associated pain. Gaining weight also will cause a generalized overload to this area and result in microtrauma and inflammation. Additionally, weight gain can place you at risk for damage to the fat pad which is normally present under the heel. With additional weight, fat pad breakdown will be an additioal source of pain in addition to the pain of the microtrauma to the plantar fascia. Recreational activities may play a role in plantar fasciitis even if you are not doing activities that are that different than those you did in the past. Perhaps a slight change in your walking or running regimen has caused an increased amount of stress on this area of the body. Sometimes a change in terrain (ie walking on the beach instead of the sidewalk) may be causative. For people who run, running on concrete sidewalks is more traumatic to the body than runing on asphalt (the concrete is harder and has less give to it.) Additionally shoes that wear out will subsequently place additional stress on different areas of the foot and ankle. The main symptom of plantar fasciitis is pain when you walk. You may also feel pain when you stand and even when you are at rest. Pain is typically seen as you first step out of bed in the morning or after you get up from sitting for a prolonged period of time. This occurs because the fibers that had begun to heal in a contracted or shortened position are stretching and tearing. The pain usually eases up with walking but will often present again after a period of rest or non-weight bearing. Clinical exam often reveals pain beneath the calcaneus (heel bone). Pain from side to side is a less common finding. Generally, plain film xrays will be taken to rule out other less common causes of heel pain such as stress fractures (hairline), calcific tendonosis, fractures, or rarely bone tumors. Some tests may be performed to examine for nerve issues that can present in the same location or in a location very close to the plantar fascia. Additionally, MRI may be indicated in certain cases. There are two main forms of treatment when discussing plantar fasciitis. The first form is to control the initial pain, inflammation, and symptoms. The second form of treatment is aimed at controlling the cause and thus preventing the problem from occurring again. Conservative measures which target this inital pain, inflammation, and symptoms include anti-inflammatory medications and cortico-steroid injections if pain is severe enough. Various athletic-type strapping can be applied to the foot and ankle to support the arch and limit overload to the fascia. Oftentimes, if strapping provides good relief, this will give a decent indication of how much a custom molded orthotic may help. Additionally, physical therapy is often recommended for various stretching excercises and for application of electrical stimulation and ultrasound treatments. Home stretching excercises which target a tight calf muscle complex will often help out a great deal. These should be performed 3-4 times daily for maximum relief. Additionally, certain products can help with stretching such as the Prostretch pictured here. This device is designed to provide a controlled stretch that is reproducible each time. This specific device is often used by athletes and by physical therapy departments. To read more about Prostretch, click here. The second arm of treatment is aimed at controlling the cause and preventing a recurrence. If prefabricated orthotics do not provide enough relief, custom molded orthotics are often recommended. Custom molded orthotics are specific for each individual foot shape and type. These devices are created in a lab from a mold or a digital scan. In contrast to prefabricated orthotics which have a limited lifespan, custom orthotics may last 15-20 years depending upon the materials they are constructed out of. Generally a firm control layer is the foundation for these devices, and this part holds up for many years. The top-cover(the part that is against your foot) and the associated cushioning will need to be refurbished from time to time. 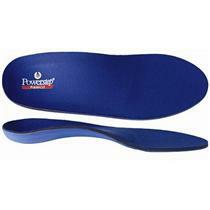 For long term control and treatment, custom molded orthotics will provide the best relief. Over time, the foot may change shape and a new orthotic will need to be fabricated. For long-standing or severe plantar fasciitis, a night splint may be recommended. This is worn at night and when at rest (ie. watching TV with your leg up on a pillow). The purpose of this splint is to prevent the fascia and calf muscles from contracting while you are at rest. The fascia begins to heal every time you rest and this helps to allow it to heal in a more stretched out position. Additionally, a CAM walker (Controlled Ankle Motion), also known as a walking boot, may be recommended to partially immobilize and allow the body to heal on its own. This is usually reserved for the most resistant cases of plantar fasciitis. If utilizing this in a weight bearing fashion does not alleviate the associated pain within 6-8 weeks, you may be instructed to utilize this device with crutches for complete non-weight bearing. A below knee cast with crutches is also a viable option to consider prior to any surgical intervention. This treatment would keep all weight off of this part of the body for a period of 6 weeks or more in an attempt to allow the body to heal on its own. Once conservative measures have been exhausted, surgical treatment may be recommended. Open surgical procedures are available where both the fascia is released and the spur is can be removed. However, the spur is usually not causing the pain associated with this procedure, this is found because the body reacts to stress by building more bone. Other surgical intervention includes the endoscopic plantar fasciotomy in which two small incisions are made, one on each side of the heel. A microscopic camera is then inserted and the medial 1/2 of the fascia is released with an endoscopic scalpal. This procedure usually has very little down time and you will be walking that day after surgery. What is a neuroma? A neuroma technically means a tumor of a nerve which is not what it actually is. A neuroma is actually a localized enlargement of the tissue that is surrounding the nerve which causes a localized compression. The bones (metatarsals) at the base of the toes can pinch the nerve and cause a localized inflamation. There is a thick ligament attaching the metatarsal bones which the nerve runs beneath. - Pain that may be alleviated some by massaging the area. - Radiating pain in the front part of the foot. - Cortisone injections are often the next recommended type of treatment for this issue. These are effective because they put the medicine directly in the area where it needs to be. Cortisone is a very powerful anti-inflammatory and is great for relief when used correctly. Use should generally be limited to 3-4 injections per year only. - When cortisone fails to provide enough relief, or when someone has already had too much cortisone, a dilute mixture of alcohol can be injected around the nerve. This is generally performed every two weeks until adequate relief is noted. Within 3-5 injections, there is generally good relief of pain and symptoms. This injection alters the nerve chemistry and slows nerve transmission. It "deadens" the nerve to a certain extent. It does not get rid of the neuroma, but makes it so you do not feel it as much. - If all of the above fail to provide relief, surgery may be considered. Traditionally, the complete neuroma was identified and resected. This can result in lengthy healing and also a neuroma can return at some point after this. This is called a stump neuroma when this occurs and this can require revision surgery. The prefered surgical technique now is to create a very small incision and to release just the ligament overlying the nerve. This is called a neuroma decompression procedure. ﻿Since the nerve is entrapped beneath the intermetatarsal ligament in the particular webspace, releasing this ligament will generally provide good relief of symptoms. Generally the nerve pain subsides within 7-10 days after the procedure. The incision for this procedure can be as small as 7-14mm long. The incision heals very quickly with minimal scar presentation. Originally neuromas were treated with surgical excision. This is when the nerve itself is completely removed. A rare but difficult complication of excision is recurrence. This is called a stump neuroma which can be just as painful and necessitate more complicated extensive surgery to treat. It is certainly preferable to release just the ligament. Bunions, hammertoes, and neuromas are three of the most common foot issues. Bunions, also known as hallux valgus, is more frequently seen in women than men but common for both. Shoes that are ill-fitting generally play a role in making this issue worse but do not usually cause it. Usually bunions are inherited. Often a muscle imbalance will increase over time and the deformity may change even with appropriate shoes. Appropriate shoes have a wide toe-box, adequate length (approx. a thumb thickness between the tip of the great toe and the end of the shoe), and are deep enough shoe to accommodate for any toe deformities. What can I do aside from shoes for bunions? Conservative treatment for bunions is limited but there are several options that can be somewhat helpful. Bunion splints can help to keep the great toe apart from the second toe and can slow the need for surgery. Splints can also be used to keep an elevated second toe down. The Darco splint is one that can help with both of these issues. This splint can be worn at night to provide a gentle stretch to the great toe and adductor tendon that is pulling the toe towards the smaller toes. Additionally, a digit wrap can provide stabilization for adjacent toe issues that often accompany the bunion. A cortisone injection into the joint may provide relief if there is an inflammatory component to the bunion or some arthritis. Additionally, a topical anti-inflammatory patch or gel may provide some relief. These include Flector Patch, or Voltaren gel. Conservative treatment usually only provides relief for a short period of time, but is certainly worth trying prior to surgical intervention. How much does bunion surgery hurt? The amount of pain that one will have from bunion surgery is highly variable, but it is generally painful since bone work is often performed. The medial bump is usually cut or chiseled away, and the metatarsal bone is usually cut so as to reorient the great toe joint. At times, the proximal phalanx of the great toe is cut as well. Bone cuts are usually stabilized with screws or wires. In addition to the bone work that is done, there are many other things that factor into the amount of pain one will experience. Some people are naturally more sensitive to any type of stimulus which will make this surgery more challenging. Also, individuals taking pain medicine, anti-psychotics/anti-depressants, and sleeping pills will most likely need much stronger medicine after surgery and may benefit from a pain pump where local anesthesia is continually infiltrated around a large nerve for 3-7 days after surgery by a very thin catheter. Generally the skin incision will heal in about 10-14 days, and the bone is healed in 6 weeks. Most of the time you can walk immediately after bunion surgery in a bandage and surgical shoe. The surgical shoe is usually used for 2 weeks until the bandage is no longer needed. After 2 weeks you can usually return to a sneaker or running shoe. After 6 weeks full excercise is generally allowed. Full exercise means starting with a very low impact activity like a stationary bicycle, then progressing to more traumatic activity as tolerated. Running and jumping should be the last activities attempted. You need to increase activity in a stepwise fashion! The soft tissue will take 3months to a year to loosen up. The great toe joint will be stiff for quite some time. If the incision is made dorsally (on the top of the joint), you will often have difficulty flexing the great toe down for some time or perhaps forever. With a medial based incision, you will not have this difficulty and the scar will not be as visible. You may need two separate incisions if it is done this way. The second incision would be made in the webspace between the first and second toes to release a tendon which may be necessary depending on the deformity. Bunion surgery usually has a fairly high success rate but can be quite painful as mentioned above. Infections can occur as with any surgery... frequently a pre-operative antibiotic is administered. Wound healing issues can occur, especially in smokers. 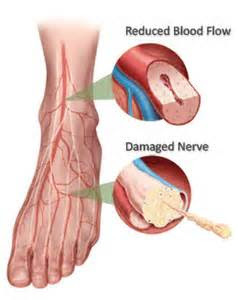 Smoking affects all small blood vessels which are critical for healing. Not only will the skin and soft tissues have a much longer time healing or may not heal, the bone work will take 50-100% longer to heal than in a non-smoker. The bone work may even go on to a non-union (where it never bonds back together as it is supposed to.). If you smoke, you should strongly consider stopping completely at least 14-23 days before the surgery to prevent these complications, or even not have the surgery. A smoker who undergoes surgery is set up for failure or revision surgery. There are specific post-op instructions which need to be adhered to in order to obtain the best result. There will be restrictions in the type of foot wear needed (post-op shoe, sneakers, etc. ), the amount of activity you are allowed, bathing. These instructions are given so that the most predictable and best outcome is obtained. If you deviate from these, healing and positional issues will occur that will give you less than a desired outcome or even beget revision surgery. Often the surgical site will be stiff for an extensive amount of time, up to 6-12 months. Full muscular strength after surgery usually takes 3-6 months. Although you are often able to bear weight immediately and results are predictable, there is a significant healing phase and you must be patient. The surgery usually takes 45-60 minutes but the healing is the difficult part. Ciprofloxacin is an antibiotic which is in the fluoroquinolone class. Although fluoroquinolones are great drugs and are extremely important in eliminating dangerous infections, they are not without side effects, just like any drug. One of the most common side effects is tendonitis and tendon rupture. This is a rare occurrence estimated at 0.14% to 0.4% of healthy patients. In the renal transplant population, an incidence of 12.2%–15.6% is reported, compared with 0.6%–3.6% for transplant recipients not receiving fluoroquinolones. The risk of tendonitis and tendon rupture is further increased in patients over 60, those taking corticosteroid drugs, and those with kidney, heart, or lung transplants. Risk is also increased with strenuous physical activity, renal failure, and previous tendon disorders such as rheumatoid arthritis. Symptoms will usually be swelling, pain, and limitations in activities. Tendonitis or rupture is usually seen in the achilles tendon most frequently. This can also be seen in the shoulder or upper extremity/wrist, but with much less frequency. It is suspected that the mechanism is one that inhibits tenocyte migration and activity which helps tendons maintain health and heal minor trauma. Generally the tendonitis is self resolving with discontinuation of the medication and immobilization with a walking boot or a cast. Occasionally complete rupture is seen and this will generally require surgery. Although this is a rare complication of Ciprofloxacin use, it can be quite disabling or even devestating. Most importantly is letting your doctor know about the above risk factors if you do need this antibiotic, or letting your doctor know immediately if you start to have any abnormal reaction.